The characteristics of a traumatic event influence the development of post-traumatic stress disorder (PTSD), and although it is now recognized that traumas considered more serious are associated with a greater incidence and a worse course of PTSD, many authors have underlined the importance of so-called “minor” events (adopting a spectrum approach to trauma) in the development of a post-traumatic symptomatology, focusing the attention on individual experience vulnerability.1,2 In this regard, a severe or life-threatening illness in one’s child can be one of the most emotionally and destabilizing events for a parent,3–5 so that subsequent revisions of the Diagnostic and Statistical Manual of Mental Disorders (DSM) have progressively introduced illness in one’s child among the events considered as traumatic. To the best of our knowledge, no data have yet been reported for the relationship between mood spectrum symptoms and post-traumatic stress symptoms in caregivers of ill children. In this regard, the aim of the present study was to fulfill this gap estimating full and partial PTSD rates as well as possible correlations with mood spectrum symptoms among parents of children with epilepsy, followed at the outpatient neurologic unit of the Department of Pediatrics, University of Pisa. Particular attention was devoted to gender differences. Parents of children with a diagnosis of epilepsy followed at the outpatient neurologic pediatric unit of a major university hospital in central Italy (Section of Pediatric Neurology of the Azienda Ospedaliero-Universitaria Pisana, Pisa, Italy) between May 2015 and February 2016 were enrolled. A total of 100 couples paired for the same child were invited to join the study (200 people). All eligible subjects provided written informed consent. The SCID was administered by psychiatrists trained and certified in the use of the study. Instruments, both the interview and the questionnaires, were performed during the execution of the child’s electroencephalography (EEG) as it takes about an hour. All subjects recruited also fulfilled the following two specific questionnaires, which explore post-traumatic stress spectrum symptoms and lifetime mood spectrum symptoms, respectively: the Trauma and Loss Spectrum-Self Report (TALS-SR)28,29 and the Mood Spectrum-Self Report (MOODS-SR) lifetime version.30 The study was conducted under the approval of the Ethics Committee of Area Vasta Nord Ovest Toscana, in accordance with the Declaration of Helsinki. The TALS-SR includes 116 items regarding the lifetime experience of a range of losses and/or traumatic events and lifetime symptoms, behaviors, and personal characteristics that might represent manifestations and/or risk factors for the development of a stress response syndrome. The instrument is organized into nine domains (further information and PDF of the tool is in www.spectrum-project.org). The responses to the items are coded in a dichotomous way (yes/no), and domain scores are obtained by counting the number of positive answers. In accordance with the aims of the study, all participants were asked to report symptoms related to their child’s epileptic syndrome. The MOODS-SR includes 140 items exploring mood spectrum symptoms, coded as present or absent for one or more periods of at least 3–5 days throughout the subject’s lifetime. The items are organized into manic and depressive components (each one sub-typed into three domains exploring mood, energy, and cognition), as well as into a section that assesses disturbances in rhythmicity and vegetative functions, yielding a total of seven domains. The number of the mood-, energy-, and cognition-manic items endorsed by subjects makes up the “manic component” (62 items) while the sum of the mood-, energy-, and cognition-depressive items constitutes the “depressive component” (63 items). The “rhythmicity and vegetative functions” (29 items) explores alterations in the circadian rhythms and vegetative functions, including changes in energy, physical well-being, mental, and physical efficiency related to the weather and season and appetite, sleep, and sexual activities (further information and PDF of the tool is in www.spectrum-project.org). The rates of endorsement of each DSM-5 diagnostic criteria as well as the TALS-SR and MOODS-SR mean scores were calculated in the overall sample and in the subgroups of mothers and fathers. In order to investigate gender differences, Chi-square test (or Fisher when appropriate) was used in the case of categorical variables and Student’s unpaired t-test was used in the case of parametric variables. Bivariate Spearman’s correlation coefficients were computed to investigate possible associations between the TALS-SR domains and the MOODS-SR ones. The statistical analyses were carried out using SPSS, Version 23.0. A total of 100 couples paired for the same child were invited to join the study (200 people); of them, 138 (69%) parents (91 [91%] mothers and 47 [47%] fathers), with a mean age of 42.4±7.4 years, provided initial written informed consent. Among the whole sample, 134 (67%) parents completed SCID-5 assessment for PTSD diagnosis (90 [90%] mothers and 44 [44%] fathers) with no significant gender difference between the two samples (P=0.420) and only 77 (57.5% of the recruited sample) parents (47 mothers and 30 fathers) and 70 (52.2% of the recruited sample) parents (44 mothers and 26 fathers) also fulfilled the TALS-SR and the MOODS-SR, respectively. We tried to increase the number of fathers by contacting them by phone as often they did not take children for the follow-up visits. Regarding mothers, the most frequent answer provided for dropping the study was the lack of time. Sociodemographic characteristics of the overall sample, as well as divided by gender, are shown in Table 1. Notes: aTwo missing data. bFive missing data. Endorsement rates of each of the DSM-5 PTSD criteria are shown in Table 2 besides full blown and partial PTSD rates. In particular, 14 (10.4%) parents (13.3% of the mothers and 4.5% of the fathers, P=0.143) reported a diagnosis of PTSD according to DSM-5 criteria. A partial PTSD was detected in 50 (37.3%) subjects with a significant difference between mothers and fathers (43.3 and 25.0% respectively, P=0.039). Notes: aPartial A = three DSM-5 symptomatological criteria fulfilled. bPartial B = two DSM-5 symptomatological criteria fulfilled. Abbreviations: DSM, Diagnostic and Statistical Manual of Mental Disorders; PTSD, post-traumatic stress disorder. Statistically significant gender differences also emerged in the endorsement rates of criterion B (intrusion symptoms) (P=0.047), criterion D (negative alterations in cognitions and mood) (P=0.010), and criterion E (alterations in arousal and reactivity) (P<0.001) (Figure 1). 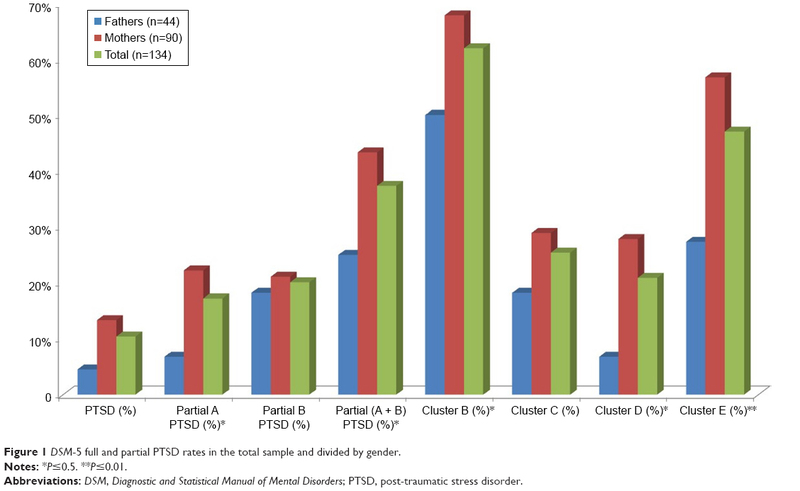 Figure 1 DSM-5 full and partial PTSsD rates in the total sample and divided by gender. Abbreviations: DSM, Diagnostic and Statistical Manual of Mental Disorders; PTSsD, post-traumatic stress disorder. Stratifying the sample both on demographic characteristics (education, occupation, number of children, and psychiatric comorbidity) and clinical features of children’s disease (type of epilepsy, type of seizures, and number of seizures), no significant difference in the post-traumatic symptomatology emerged. 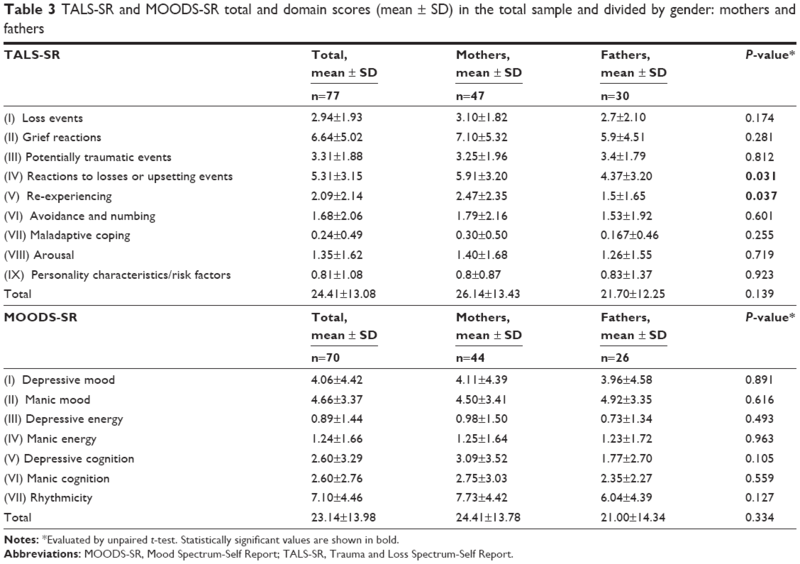 Mothers reported significant higher endorsement rates with respect to fathers in the following TALS-SR domains: “reactions to losses or upsetting events” (P=0.035) and “re-experiencing” (P=0.037). No gender differences emerged in the MOODS-SR domains’ scores (Table 3). Notes: *Evaluated by unpaired t-test. Statistically significant values are shown in bold. Abbreviations: MOODS-SR, Mood Spectrum-Self Report; TALS-SR, Trauma and Loss Spectrum-Self Report. Computation of the bivariate correlation coefficients showed moderate-to-good significant positive correlations between TALS-SR domain IX (personal characteristics/risk factors) and MOODS-SR domain IV (manic energy), TALS-SR domain II (grief reactions) and MOODS-SR domain VI (manic cognition), TALS-SR total scores and MOODS-SR domain VI (manic cognition), and TALS-SR and MOOD-SR total scores (Table 4). The last correlation was the only one that persisted in the subgroup of mothers (Table 5). In contrast, in the fathers subgroup emerged several positive associations, particularly the following three strong associations: first, between TALS-SR domain IX (personal characteristics/risk factors) and MOODS-SR domain II (manic mood); second, between TALS-SR domain IX (personal characteristics/risk factors) and MOODS-SR domain IV (manic energy); and third, between TALS-SR total score and MOODS-SR total score (Table 6). Note: Green: moderate-to-good correlations (r=0.40–0.60) and bold: other correlations (r<0.40). Note: Red: strong correlations (r=0.60–0.80), green: moderate-to-good correlations (r=0.40–0.60), and bold: other correlations (r<0.40). Our results confirm some of our previous data6 showing ~10% of parents of epileptic children reporting a diagnosis of PTSD, with a further 40% of parents endorsing criteria for partial PTSD. Intrusion symptoms and distressing memories also represented the most frequent symptoms in parents exposed to this kind of potentially traumatic event. It is interesting to note that the frequency of the partial forms of PTSD is perfectly in line with the data that has emerged in previous studies on parents of children with acute or chronic diseases. Farley et al,31 investigating parents of children with heart transplants, showed rates as high as 40% of partial PTSD; consistently; Poder et al32 reported similar rates among parents of neoplastic children. Our results seem to corroborate the importance of subjective impact of the seizure, rather its objective severity, in order to trigger post-traumatic stress symptoms in the caregiving parents as no statistically significant relationship emerged between post-traumatic stress spectrum symptoms and the clinical characteristics related to epileptic disease, such as type of epilepsy (idiopathic/cryptogenic and symptomatic forms) and type and number of seizures. There were no statistically significant correlations between arousal domain and number of seizures and this was surprising as we expected that repeated exposure, as witnesses, of parents to seizures could increase alarm responses and thus affect arousal symptoms. Consistently, Lindahl Norberg et al33 evidenced how disease variables such as infant prognosis and the presence of a relapse in the clinical history did not impact on PTSD rates among parents of children with cancer. An increased risk also emerged in the mothers with respect to fathers. In particular, mothers presented statistically significant higher rates of endorsement in the majority of the PTSD nuclear symptom clusters, such as intrusion symptoms, negative alterations in cognitions and mood, and alterations in arousal and reactivity, highlighting the increased vulnerability of female gender to consequences of trauma. In the US NCS Replication (NCS-R), Kessler et al reported PTSD rates as high as 6.8% according to DSM-IV with women (9.7%) showing higher rates than men (3.6%). Similar gender differences in PTSD rates have been reported in the aftermath of natural disasters, particularly earthquakes.25,34 The present results seem to confirm these data even in the case of a severe illness in a child. The analysis of the post-traumatic stress spectrum through the TALS-SR supported these data as mothers presented higher rates of endorsement in all domains, reaching statistical significance in both the reactions to losses or upsetting events and re-experiencing domains. We might speculate that lifetime mood spectrum symptoms may reduce the difference between females and males in terms of vulnerability to the post-traumatic stress spectrum. A similar result was found by Dunn et al42 in 2012 where the presence of psychiatric comorbidity, especially depression or anxiety, flattened the differences between mothers and fathers in terms of PTSD rates. Several limitations have to be taken into account when discussing our data. First is the limited sample size despite, to the best of our knowledge, this study has the largest sample of parents of children with epilepsy so far reported in literature. Second is the fact that this is a cross-sectional study without a control group and gender homogeneity that impairs the generalizability of the results. Last is the lack of information on the characteristics of epileptic illness of the children and on psychosocial comorbidities, in particular behavioral problems, which could have an impact on the TALS-SR scores. Despite the limitations mentioned above, this study offers an important contribution to the detection of post-traumatic stress spectrum symptoms among parents of seriously ill children. Nevertheless, future work is needed to elucidate the relevance of recognizing these symptoms and the impact that they could have in the caregiving process of a particular and complex illness such as epilepsy. Dell’Osso L, Carmassi C, Massimetti G, Daneluzzo E, Di Tommaso S, Rossi A. Full and partial PTSD among young adult survivors 10 months after the L’Aquila 2009 earthquake: gender differences. J Affect Disord. 2011;131(1–3):79–83. Friedman MJ, Resick PA, Bryant RA, Brewin CR. Considering PTSD for DSM-5. Depress Anxiety. 2011;28(9):750–769. Barakat LP, Kazak AE, Meadows AT, Casey R, Meeske K, Stuber ML. Families surviving childhood cancer: a comparison of posttraumatic stress symptoms with families of healthy children. J Pediatr Psychol. 1997;22(6):843–859. Kazak AE, Barakat LP. Brief report: parenting stress and quality of life during treatment for childhood leukemia predicts child and parent adjustment after treatment ends. J Pediatr Psychol. 1997;22(5):749–758. Landolt MA, Boehler U, Schwager C, Schallberger U, Nuessli R. Post-traumatic stress disorder in paediatric patients and their parents: an exploratory study. J Paediatr Child Health. 1998;34(6):539–543. Carmassi C, Corsi M, Gesi C, et al. DSM-5 criteria for PTSD in parents of pediatric patients with epilepsy: what are the changes with respect to DSM-IV-TR? Epilepsy Behav. 2017;70(pt A):97–103. Bruce M. A systematic and conceptual review of posttraumatic stress in childhood cancer survivors and their parents. Clin Psychol Rev. 2006;26(3):233–256. Cabizuca M, Marques-Portella C, Mendlowicz MV, Coutinho ES, Figueira I. Posttraumatic stress disorder in parents of children with chronic illnesses: a meta-analysis. Health Psychol. 2009;28(3):379–388. Cernvall M, Alaie I, von Essen L. The factor structure of traumatic stress in parents of children with cancer: a longitudinal analysis. J Pediatr Psychol. 2012;37(4):448–457. Horsch A, McManus F, Kennedy P. Cognitive and non-cognitive factors associated with posttraumatic stress symptoms in mothers of children with type 1 diabetes. Behav Cogn Psychother. 2012;40(4):400–411. Iseri PK, Ozten E, Aker AT. Posttraumatic stress disorder and major depressive disorder is common in parents of children with epilepsy. Epilepsy Behav. 2006;8(1):250–255. MacLeod JS, Austin JK. Stigma in the lives of adolescents with epilepsy: a review of the literature. Epilepsy Behav. 2003;4(2):112–117. Bandstra NF, Camfield CS, Camfield PR. Stigma of epilepsy. Can J Neurol Sci. 2008;35(4):436–440. De Souza EA, Nista CR, Scotoni AE, Guerreiro MM. Feelings and behaviors of parents of children with epilepsy. Arq Neuropsiquiatr. 1998;56(1):39–44. Jones C, Reilly C. Parental anxiety in childhood epilepsy: a systematic review. Epilepsia. 2016;57(4):529–537. Goldberg JF, Garno JL. Development of posttraumatic stress disorder in adult bipolar patients with histories of severe childhood abuse. J Psychiatr Res. 2005;39(6):595–601. Pollack MH, Simon NM, Fagiolini A, et al. Persistent posttraumatic stress disorder following September 11 in patients with bipolar disorder. J Clin Psychiatry. 2006;67(3):394–399. Strawn JR, Adler CM, Fleck DE, et al. Post-traumatic stress symptoms and trauma exposure in youth with first episode bipolar disorder. Early Interv Psychiatry. 2010;4(2):169–173. Dell’osso L, Stratta P, Conversano C, et al. Lifetime mania is related to post-traumatic stress symptoms in high school students exposed to the 2009 L’Aquila earthquake. Compr Psychiatry. 2014;55(2):357–362. Freeman MP, Freeman SA, McElroy SL. The comorbidity of bipolar and anxiety disorders: prevalence, psychobiology, and treatment issues. J Affect Disord. 2002;68(1):1–23. Otto MW, Perlman CA, Wernicke R, Reese HE, Bauer MS, Pollack MH. Posttraumatic stress disorder in patients with bipolar disorder: a review of prevalence, correlates, and treatment strategies. Bipolar Disord. 2004;6(6):470–479. Fullerton CS, Ursano RJ, Epstein RS, et al. Gender differences in posttraumatic stress disorder after motor vehicle accidents. Am J Psychiatry. 2001;158:1486–1491. Kobayashi I, Delahanty DL. Gender differences in subjective sleep after trauma and the development of posttraumatic stress disorder symptoms: a pilot study. J Trauma Stress. 2013;26(4):467–474. Carmassi C, Akiskal HS, Bessonov D, et al. Gender differences in DSM-5 versus DSM-IV-TR PTSD prevalence and criteria comparison among 512 survivors to the L’Aquila earthquake. J Affect Disord. 2014;160:55–61. Dell’Osso L, Carmassi C, Stratta P, et al. Gender differences in the relationship between maladaptive behaviors and post-traumatic stress disorder. A study on 900 L’ Aquila 2009 earthquake survivors. Front Psychiatry. 2012;3:111. McLaughlin KA, Koenen KC, Friedman MJ, et al. Subthreshold posttraumatic stress disorder in the world health organization world mental health surveys. Biol Psychiatry. 2015;77(4):375–384. Dell’Osso L, Shear MK, Carmassi C, et al. Validity and reliability of the Structured Clinical Interview for the Trauma and Loss Spectrum (SCI-TALS). Clin Pract Epidemiol Ment Health. 2008;4:2. Dell’Osso L, Carmassi C, Rucci P, et al. A multidimensional spectrum approach to post-traumatic stress disorder: comparison between the Structured Clinical Interview for Trauma and Loss Spectrum (SCI-TALS) and the Self-Report instrument (TALS-SR). Compr Psychiatry. 2009;50(5):485–490. Dell’Osso L, Armani A, Rucci P, et al. Measuring mood spectrum: comparison of interview (SCI-MOODS) and self-report (MOODS-SR) instruments. Compr Psychiatry. 2002;43(1):69–73. Farley LM, DeMaso DR, D’Angelo E, et al. Parenting stress and parental post-traumatic stress disorder in families after pediatric heart transplantation. J Heart Lung Transplant. 2007;26(2):120–126. Poder U, Ljungman G, von Essen L. Posttraumatic stress disorder among parents of children on cancer treatment: a longitudinal study. Psychooncology. 2008;17(5):430–437. Lindahl Norberg A, Pöder U, Ljungman G, von Essen L. Objective and subjective factors as predictors of post-traumatic stress symptoms in parents of children with cancer – a longitudinal study. PLoS One. 2012;7(5):e36218. Carmassi C, Stratta P, Massimetti G, et al. New DSM-5 maladaptive symptoms in PTSD: gender differences and correlations with mood spectrum symptoms in a sample of high school students following survival of an earthquake. Ann Gen Psychiatry. 2014;13:28. Dell’Osso L, Carmassi C, Rucci P, et al. Lifetime subthreshold mania is related to suicidality in posttraumatic stress disorder. CNS Spectr. 2009;14(5):262–266. Koenen KC, Ratanatharathorn A, Ng L, et al. Posttraumatic stress disorder in the World Mental Health Surveys. Psychol Med. 2017;47(13):2260–2274. Rodenburg R, Meijer AM, Deković M, Aldenkamp AP. Family factors and psychopathology in children with epilepsy: a literature review. Epilepsy Behav. 2005;6(4):488–503. Shatla R, Sayyah Hel S, Azzam H, Elsayed RM. Correlates of parental stress and psychopathology in pediatric epilepsy. Ann Indian Acad Neurol. 2011;14(4):252–256. Leidy NK, Elixhauser A, Vickrey B, Means E, Willian MK. 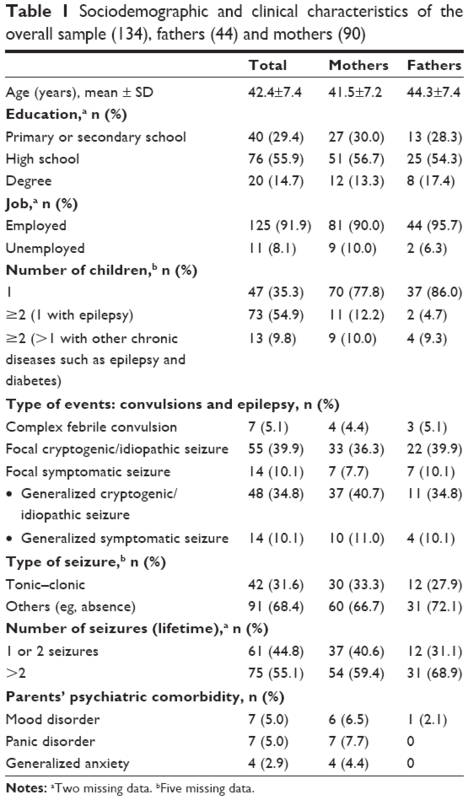 Seizure frequency and the health-related quality of life of adults with epilepsy. Neurology. 1999;53(1):162–166. Duffy LV. Parental coping and childhood epilepsy: the need for future research. J Neurosci Nurs. 2011;43(1):29–35. Dunn MJ, Rodriguez EM, Barnwell AS, et al. Posttraumatic stress symptoms in parents of children with cancer within six months of diagnosis. Health Psychol. 2012;31(2):176–185.